Is there any fabric more perfect for warm weather than linen? It’s cool, it’s comfortable, and it’s flattering, and this season, we’re especially drawn to the way artists have transformed the textile into truly remarkable pieces with unique details and interesting silhouettes. So, to honor this spring-ready fabric, we’ve invited our brand ambassadors to share with us their favorite linen piece from our newest apparel collection. Today, Cindy Hattersley of Rough Luxe Lifestyle extols the virtues of the Roma Top and striped Lantern Pant by Lisa Bayne. 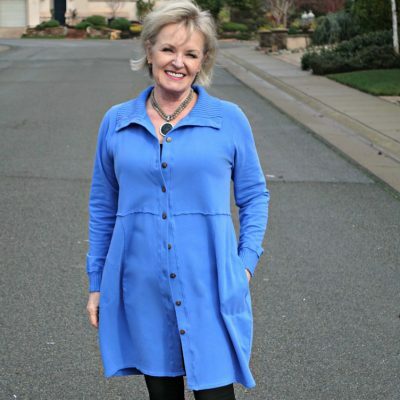 I am Cynthia Hattersley, an interior designer on the central coast of California and the author of Rough Luxe Lifestyle. 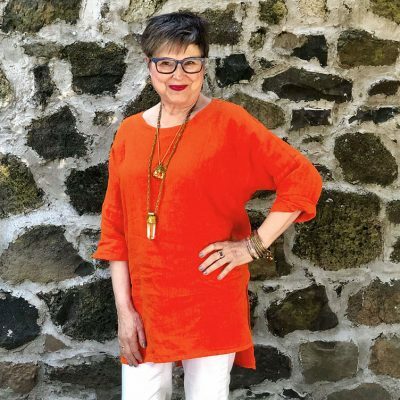 My blog is my outlet for celebrating my signature Rough Luxe Style; there I write about interior design, gardens, travel, and over-50 fashion. Artful Home recently asked if I would write a post for their blog about some of my favorite linens from the new collection, and I happily agreed. Not only am I a huge Artful Home fan, but I also live in linen in the summer. We spend most summer weekends at our vacation home in the Paso Robles wine country, where it regularly reaches 90-degree temperatures. At 63, I no longer wear shorts, so linen is my go-to. 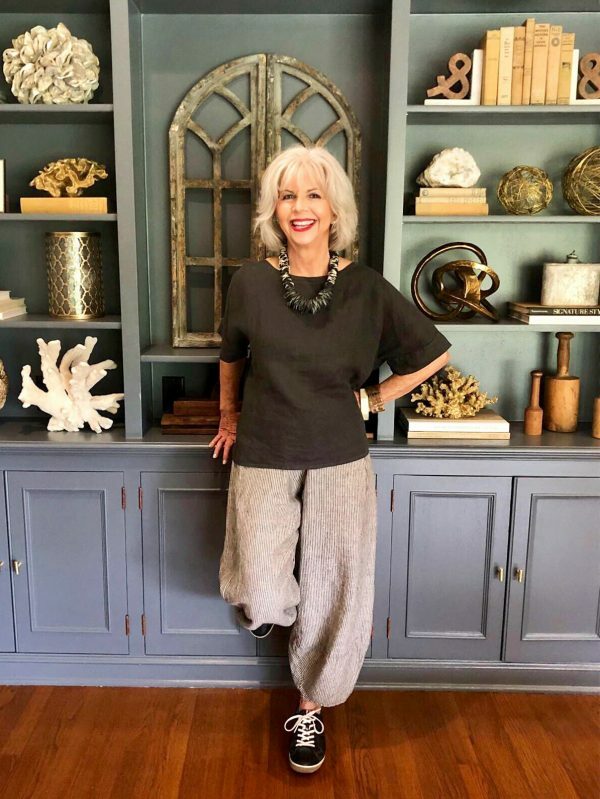 Not long ago, Artful Home’s CEO, Lisa Bayne, started her own clothing line, and many of her items have quickly become my favorites. For spring, that includes the Roma Top, which I was drawn to for its versatility and breathability. Here I’m pairing the Roma Top with the striped Linen Lantern Pant (more on those shortly), but I think it would be fabulous with white skinny jeans as well. I own the Lisa Bayne Lantern Pant in a French terry fabric. 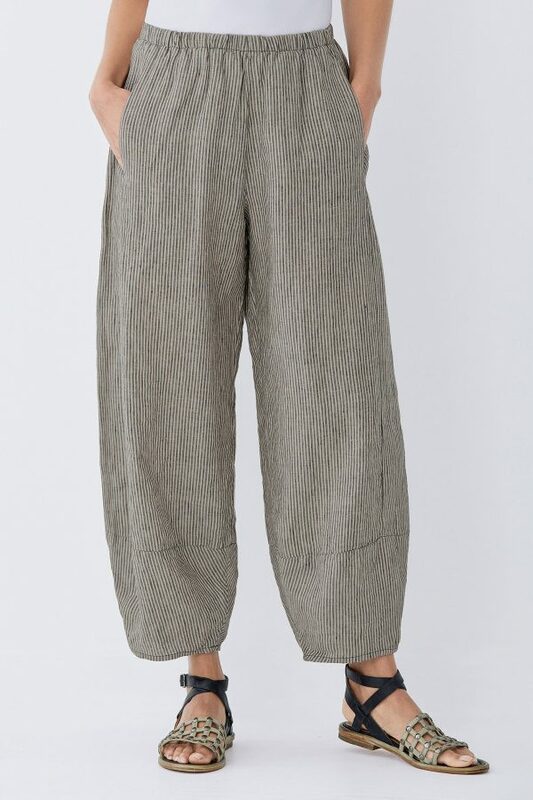 I thought the striped Linen Lantern Pant would be a great alternative for summer temperatures. If you prefer something a little less boxy on top, the Matte Jersey Ruched Tee would be a great substitute. I am also coveting the Antonia Sandal they have paired with the Lantern Pant. As a professional interior designer, I’ve found that install days require more casual attire and clothes that breathe. This outfit will be a favorite for summer install days. artwork from l to r: Swirls Rectangle Pillow by Ayn Hanna, Shape Into Sunset by Laura Nugent, Warthog by Ronnie Gould, Gigantic Zinnia Bowl by Jennifer Falter, Quatrato by Barbara Gilhooly, Fibonacci Pillow by Ayn Hanna. All of the art pieces in the above photo are available at Artful Home. 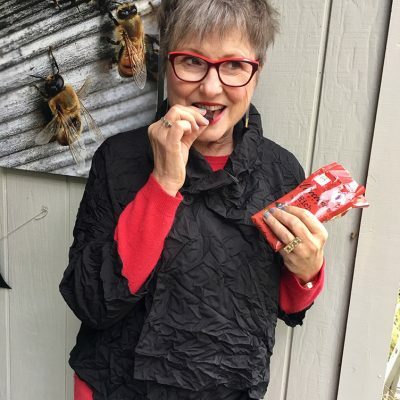 Thanks so much to Artful Home for letting me guest post. If you love travel, entertaining, fashion, interiors, and gardening, I would love to have you pop over to my blog, Rough Luxe Lifestyle. Thank you so much for letting me guest post today. I am crazy about the new Linen Collection and I think everyone else will be too! I love the Roma top and sandals. You always look so good in anything you wear from Artful Home. So stylish Cindy! Love this post— nicely done! I love Cindy’s fashion sense and interior design style! She is a true inspiration. Your linen collection is amazing…I am off to explore more. ANYTHING YOU DO I WILL COPY!!!!!!!!!!!!! I still NEED to get that WHITE SHIRT!!!!!!!!!! Love the entire outfit and the smile! Perfect time of year to explore linen. Also, your shelves look amazing. I never would have considered linen, as I always look so rumpled in it. But you have changed my mind! Linen really works with this styling! Love the outfit! It looks great on you and super comfy! I also love the shelves behind you. I think I recognize those. Cindy the outfit looks great on you!! I agree it is the perfect summer look. I love linen too! The texture, the breathability, the way it takes color! 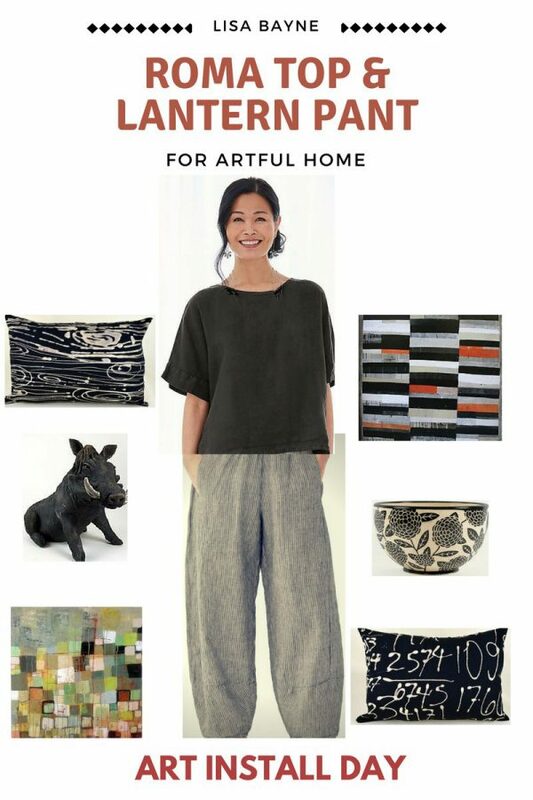 That Artful Home outfit is perfect on you. Cindy, you look so great! You have made me think about wearing linen this summer. Our nation’s capital is turning from winter to spring and temperatures are already climbing into the eighties. What to wear? Cindy has come to the rescue as someone with simply the best taste and a nose where to find something to feel comfortable yet chic. Thanks for the tips! As it’s my birthday today, I may just rush an order! Cindy you look so pretty! You have been stylish as long as I have known you. Comfort with style is what I love, too. Can’t wait to see you this summer. Everything works about this!! Your outfit looks so stylish, BUT also comfortable and effortless both in that the clothes are easy to wear, but also not too done up! The tennis shoes top it off. Will keep this look in mind when I want to look great, but also like I am not trying too hard. 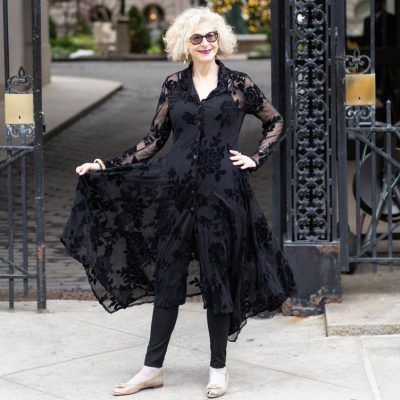 Cindy, Another great post from one of the most stylish ladies I know. You make linen seem like a fantastic choice. I always thought of wrinkles, but might take another look now. Love those pants. I also have the French Terry ones. Of course, I bought them because you raved about them. I would wear that outfit everyday! Love the pants and love the ease of the top.I also saw a beautiful red linen dress on the website. Another Lisa Bayne beauty.